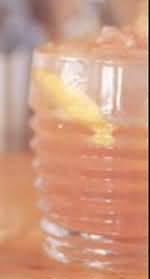 Pour the lemon juice and sugar syrup into a mixing glass. Shake in the bitters, then add the grenadine, rum, orange and lemon slices. Stir and chill in the refrigerator for 3 hours. Fill an old fashioned glass with cracked ice, pour in the punch.